1st row: Make a chain. The number of chains depends on the size of the flower, you want to crochet. For the smallest one I have made a chain of 3 ch.Join them in a circle. 2nd row: crochet 5 half double crochet stitches in that circle. You get the foundation circle for your flower of 5 hdc. 3rd row: Crochet 3 chains, then crochet one double stitch in the first hdc of the circle, crochet 3 more chains and crochet them into the same hdc of the circle. That is your first crochet flower petal. Basically, you crochet 1 petal in each of the hdc of the foundation. Each petal consists of 1 chain of 3 ch, 1 double crochet stitch and 1 more chain of 3 ch. That is for a small flower. To make a bigger flower, you make a foundation chain of 6 ch. Then crochet 10 hdc in the circle. You crochet each petal in 2 dhc of the flower foundation. 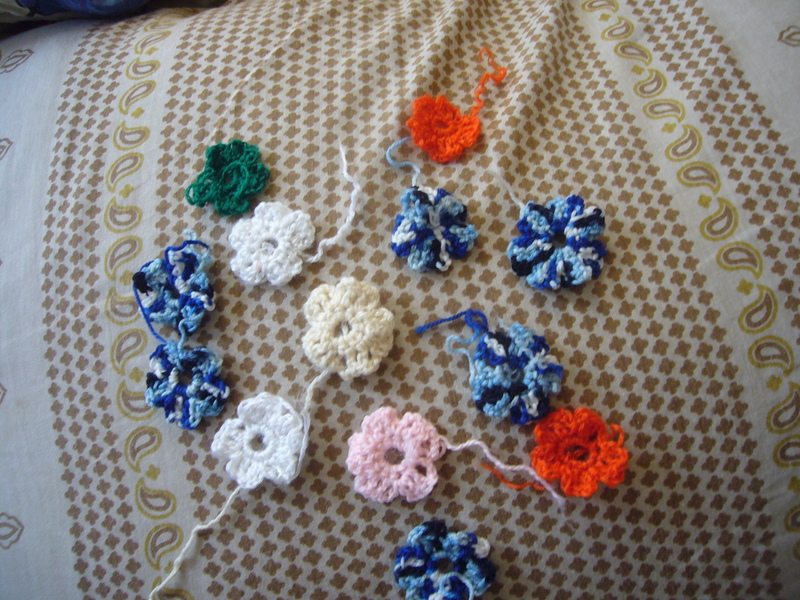 You make a chain of 3 ch, Then make 2 double crochet stitches in the next 2 hdc of the crochet flower foundation. You end the petal by crocheting a chain of 3 ch and crocheting it through the same 2nd hdc of the petal. Then you make a next 2 ch chain out of this same hdc and start a next petal. I hope these crocheting instructions for crochet flower make sense. I’ll try to add step by step photos next later on to this free flower crocheting pattern. This entry was posted in Crocheting and tagged crafts, crochet, crocheting, crocheting for beginners, crocheting ideas, flower crocheting, free crochet pattern, how to crochet a flower. Bookmark the permalink.